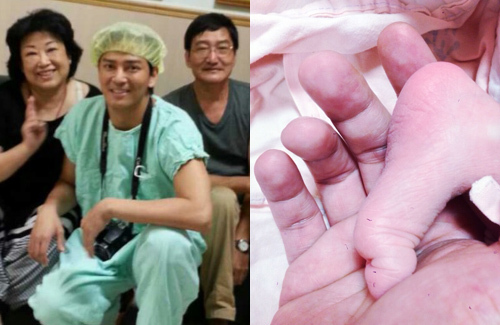 Daniel Chan (陳曉東) proudly announced the birth of his daughter on July 5. He shared his gratitude towards everyone’s concerns and praised his wife, Wang Yuxian (王妤嫻), for being a strong woman. Accompanying the Weibo post was an adorable photograph of the newborn infant’s foot. Nervous but excited, Daniel accompanied his wife the entire time at the hospital during the birth of his daughter. His father, mother, younger brother, and younger sister-in-law flew to Hong Kong from different countries around the world to witness the special moment. They eagerly waited outside the delivery room for the good news. Meanwhile, Daniel was right by his wife’s side in order to capture every moment of his daughter’s birth. The birth procedure went smoothly and the infant was born within five minutes. Daniel expressed that his wife did not scream nor cry throughout the process. According to the doctor, the baby girl is taller than most others and will probably grow up to be a beautiful woman with large eyes. While Daniel thinks the baby resembles his wife, his wife believes she resembles him more. At the moment, the couple has not yet decided on a name for the baby. 5 mins? Must be really easy and quick delivery. Well good that mother and infant are safe and healthy. 5 minutes?? That’s not fair. LOL. Congrats to the new parents! Five minutes?! Lucky! Congrats to the family! A 5-minute labour is really really quick for a first born baby. Labour usually takes hours! I really loled at this! To me, Daniel Chan is just a has-been, nowhere near great or super celebrity. Will she be ostracized if she grew up with normal size eyes? The 5 minutes probably means the actual delivery time, not the entire labour pain/ contraction process which usually take hours. 5 mins! That’s fast! Glad to know both are safe though!